You know what? It isn't that hard to make healthy pizza. Pizza would always be pretty healthy if we chose not to put 1/2 pound of cheese on every slice. Here on Snack Girl, I have featured English muffin pizzas, Triscuit pizzas, and even made over a frozen pizza to get readers to try a healthier version of pizza. Well, do I have a solution for you. Make the pizza in a portobello mushroom cap! you don't have to make crust! Yes, this is SO easy it is ridiculous and the taste is phenomenal. Now, the down side is that in my neighborhood a portobello mushroom is running about $1 each. But keep in mind the health benefits. 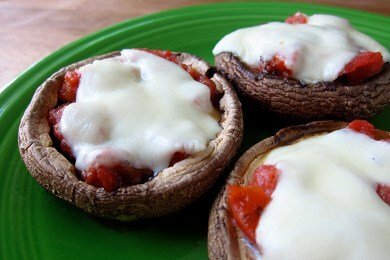 You are eating a 22 calorie mushroom instead of a load of crust (and it is gluten free)! In the recipe below, I used diced fire roasted tomatoes to fill the caps. I like them because they already have some seasoning and they have texture - as compared with pizza sauce. Also, I used fresh mozzarella because I love the creaminess. Feel free to use any cheese or tomato combo that you have in the house. Kids will love making these and you can make them ahead to reheat later. Preheat oven to 350. Spray rimmed baking sheet with non-stick spray. Clean mushroom caps with paper towel and remove stems. Spoon 1/4 cup tomatoes with or without juice into cap. Layer mozzarella cheese over tomatoes. Bake in oven for 20 minutes. Serve with a knife and fork. Wish I was a mushroom fan, but I'm not so I do this recipe with zucchini! It's so good! Love portabella pizzas but found out Friday I have to limit mushrooms thanks to Chemo complications...ugh. Zucchini pizza's sound interesting though do you use tomatoes on those as well? Any other cheese suggestion as mozz isn't a hard cheese and is a no no for me right now? Thanks so much for the inspiring posts. These are great on the grill too. I love these with fresh basil! I also recommend roasting the mushrooms first and adding the toppings after the mushrooms are cooked. Otherwise the mushrooms are watery. Also great on grill. Grill flat side down about 5 minutes turn over and add the tomatoes and cheese for a couple minutes more. Like the adding basil. I make these often. I use thinly sliced fresh tomato, plenty of herbs (oregano, basil, mixed Italian seasoning, garlic, whatever personal pizza preference), finely chopped onion, green pepper, sliced black olives, turkey pepperoni. I have also used thin multi-grain sandwich rolls--100 calories for 2 halves. Makes a nice "thin" crust pizza. What a GREAT idea! Can't wait to try!